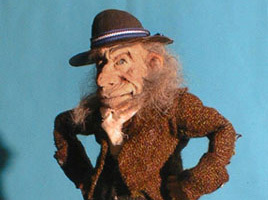 These puppets were made for the film ”Tar Valley Mystery”; a story about the dangers of alcohol and accordion playing. The devil character were only visible from the waist up, so no legs were necessary . The gnome puppet is animated dancing wildly, so I used an old armature from Armaverse stuck to his bum to keep him airborne while jumping. This support was removed in ”post production” using Photoshop.